ALLMAX Nutrition R-ALA promotes the muscle's uptake of glycogen. It does this by optimizing insulin activity and helps speed up the amount of nutrients shuttled to your muscles pre and post-workout. R-ALA can help speed up muscle recovery and can be combined with creatine to create a powerful and anabolic compound. ALA is also an extremely potent antioxidant, so powerful it is known as the 'Universal Antioxidant'. Anyone who trains regularly knows exercise can place a lot of wear and tear on your body. By supplementing with ALLMAX Nutrition R-ALA you can protect your body from the oxidative damage associated with intense training. 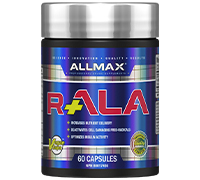 ALLMAX Nutrition R-ALA Complex is a scientifically proven Nutrient Delivery and Antioxidant complex. Unlike competitive ALA Products, this complex supplies 125mg of the active R(+) isomer, the pure mitochondrial form of ALA naturally found in the human body. This specific isomer is the exact form linked to the beneficial properties of alpha lipoic acid. Commercially available ALA Products on the market today consist almost entirely of the S (-) isomer of alpha lipoic acid. These inferior products have significantly weaker nutrient delivery and antioxidant properties. If your ALA product does not include the R (+) isomer of ALA, make the switch to ALLMAX Nutrition R-ALA Complex today.